Deluxe Large 2 floor Lakefront Condo with Pool and Hot Tub! Our reviews say it all! This luxury two floor 1300 s.f. condo at Barona Beach Lakefront Resort is the perfect location for your vacation. This place has it all! Beautiful kid friendly sandy beach with dock and fire pit. Large heated pool and hot tub with extensive deck, lounge chairs and sun umbrellas. Great spot to start your Westside Winery tour. Thirteen amazing local wineries including Quails Gate, Mission Hill, Mt. Boucherie, Volcanic Hills, Beaumont, Kalala Organic, The Hatch, Rollingdale, Ciao Bella, Indigenous World, Off the Grid, Grizzli and Little Straw. Many scenic walking, hiking and biking trails in the nearby area. Numerous golf courses are just minutes away. Very close to a large amount of shops, grocery stores and restaurants. This unit is beautifully decorated with high end furnishings throughout. Large deck with natural gas BBQ and patio furniture. Direct view of the pool, hot tub, beach and Okanagan Lake. The back of the condo has a great view of Mission Hill Winery, the orchards and the scenic canal. This condo is just steps away from the large grass lawn that is perfect for the kids, the pool, the hot tub and sandy beach. This is one of the few units with a two floor townhouse style floor plan. Perfect layout for a family and/or entertaining. Upstairs offers two large bedrooms. Master bedroom has a King bed and full ensuite with soaker tub, separate shower and granite countertop. Second bedroom has a Queen bed with full ensuite including a shower. Bedrooms are separated by a loft area that is great for kids with a sofa bed and flat screen TV. Open floor plan downstairs including a gourmet kitchen (stainless steel appliances, gas range and granite counter top) stocked with everything you'll need to prepare meals and entertain. Living room has a flat screen TV, DVD player and an iPod compatible sound system. 7 night rentals only (Sat to Sat) in July and August. We live in Vancouver, but have always enjoyed visiting the Okanagan. We love the climate, the outdoor activities, the lake and the wineries. We picked Barona Beach because it is a beautiful lakefront resort easily accessible from Vancouver and just a short 10 minute drive from downtown Kelowna. Master bedroom, living room and the deck have a direct view of beautiful Okanagan lake and the pool area. Second bedroom has spectacular view of Mission Hill winery. One designated parking spot. Overflow parking lot available. Can access condo by stairwell or elevator. Common grass area where kids can play. Beautiful warm saltwater pool and hot tub. 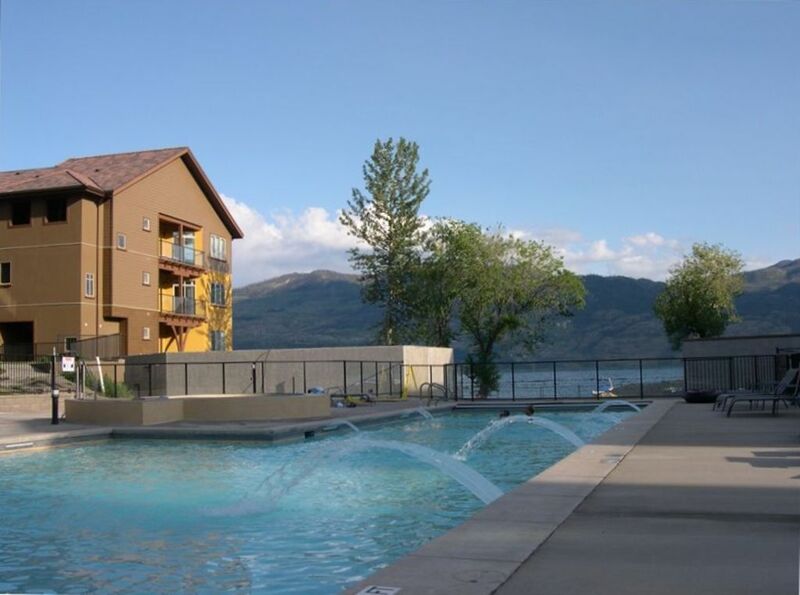 We had a wonderful stay in Kelowna west at this beautiful condo that is well equiped, clean, comfortable & spacious. Loved the terrasse! We enjoyed the region. Well situated, the condo is close to many Vinyards: Mission Hill, Quail’s Gate ( diner was fantastic), Grizzli, Indigenous World, and few more. We had time to visit them all. We also hiked on Mt Boucherie, the view is worth the walk. Downtown Kelowna, is a short distance away, nice walk on the lake. Visit of Sandhill W( coupons for free tasting in many brochures). We had lunch at Antico Pizza Napoletana on Bernard, another day at The Little Hobo, really nice homemade food! South of Kelowna, it is a nice drive on Lakeshore dr, stopped at Summerholl Pyramid( free tasting), and south to Carmelis Goat cheese ( not easy to find, but very fresh cheese). South of the condo on 97, it is a nice drive to go to Osoyoos. We had a nice lunch on a terrasse at NK’Mip, view of the lake. Driving back, we stopped at the Information center in Penticton, they gave us free tasting passes for 3 differents vinyards towards Naramata. We also stopped in Summerland, on the lake ( public bathrooms), and in town. North of the Okanagan lake, it is a nice drive to Vernon. Passing by Kalamalka lake ( exit at Lakeshore dr for view), visit Bx Press Cidery, lunch at Eatelogy( homemade food). On the way back, there are more winyards to visit, exit at Lakewood Mall. Nice drive back on the lake, the views are spectaculars! The map available at the airport or at any information center is your best friend! Okanagan region is beautiful, and the condo made our stay even better! Thank you very much for the detailed review! We look forward to visiting the places in your review that we haven’t tried yet. Great place, central to everything - great for families! We thoroughly enjoyed our stay, the place was well maintained, clean and central to everything. Tons of kids and pool was almost always filled with kids, so a great place to go on a family vacation. Lots to do in the area - Nut Farm, Myra Canyon Bike Trail, Wineries etc. Beautiful property with great view. Very clean and ready upon arrival. Really enjoyed our time. Very family friendly resort. Had an issue with our parking spot being occupied for first 3 days but was resolved by security. Clean organized condo with great view and quick access to pool. Under five minute drive from multiple wineries and 15 mins from downtown Kelowna. Great experience. Our family of 4 has stayed at this unit for the past 2 years for a week and loved it. Great condo and great property for a family vacation! This place was immaculate with modern amenities and everything you needed away from home. The view was beautiful and we enjoyed the hot tub. The pool was a little chilly (in June) but we didn't have much time to swim on our visit. We love the Mission Hill and Quails' Gate Wineries (both the wine and the wineries) and both are very close by. The owners were wonderful and responsive to any inquiries. We were very happy with this place and would definitely stay here again!